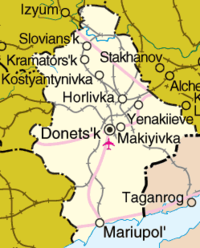 Donetsk Oblast (Ukrainian: Донецька область, Donets’ka oblast’; an aa referred tae as Donechchyna — Ukrainian: Донеччина Donechchyna; Roushie: Донецкая область, Donetskaya oblast) is an oblast (province) o eastren Ukraine. Its admeenistrative centre is Donetsk. Historically, the province is an important pairt o the Donbas region. Till November, 1961, it bore the name Stalino Oblast in honour o Joseph Stalin. Important ceeties athin the oblast include: Sloviansk, Horlivka, Kramatorsk, Makiivka, Mariupol, Yenakiieve. Donetsk Oblast is locatit in sootheastren Ukraine. The aurie o the oblast (26,900 km²), comprises aboot 4.4% o the tot aurie o the kintra. The oblast borders the Dnipropetrovsk an Zaporizhia Oblasts on the soothwast, the Luhansk Oblast on the northeast, the Rostov Oblast in Roushie on the east, an wi the Sea o Azov on the sooth. Its langitude frae north tae sooth is 270 km, frae east tae wast – 190 km. The extreme pynts o the oblast's borders are: Bilosarayska Kosa (spit) on the sooth, Shevchenko o Velykonovosilkivskyi Raion on the wast, Verkhnyi Kut o Shakhtarskyi Raion on the east, an Lozove o Krasnolymanskyi Raion on the north. The state historic-airchitectural preserve near the ceety o Sviatohirsk wi the Sviatohirsk Lavra wis nominatit for the Sieven Wonders o Ukraine. The oblast is subdividit intae 18 raions (admeenistrative destricts). It consists o 28 municipalities, 52 ceeties, 131 touns, an mair nor 1,124 veelages. The local admeenistration o the oblast' is controlled bi the Donetsk Oblast Rada. The govrenor o the oblast' is the Heid o Donetsk Oblast admeenistration, appointit bi the Preses o Ukraine. 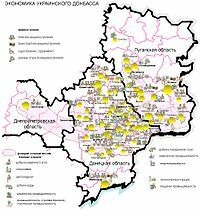 The population o Donetsk Oblast is 4.7 million (2004), which constitutes 10% o the owerall Ukrainian population, makin it the maist populous an maist densely populatit region in the kintra. Its lairge population is due tae the presence o several big industrial ceeties an numerous veelages agglomeratit aroond them (see urbanization). Durin the 2004 presidential election, poleetical supporters o Viktor Yanukovych threatened tae demand autonomy for Donetsk an neighbourin oblasts if the election o thair candidate wis no recognised. Housomeivver, nae offeecial muives wur iver made. As o the Ukrainian Naitional Census, 2001, the ethnic groups athin the Donetsk Oblast are: Ukrainians — 2,744,100 (56.9%), Roushies — 1,844,400 (38.2%), Greeks – 77,500 (1.61%), Belaroushies — 44,500 (0.92%), Crimean Tatars — 19,200 (0.4%), Armenians — 15,700 (0.33%), an Jews – 8,800 (0.18%). The leids spoken athin the oblast' are: Roushie — 74.9%, Ukrainian — 24.1%, an Armenie — 0.13%. Cairt o the economic activity in the Donbass, includin the Donetsk Oblast. The Donetsk Oblast covers mair nor ane hauf coal, fieenished steel, coke, cast iron an steel production in Ukraine. Ferrous metallurgy, fuel industry an pouer industry are in demand in the structur o industry production. Thare are aboot 882 industry enterprises that are on independent balance, an 2,095 sma industry enterprises in the oblast. The oblast' haes a developed transport infrastructur which includes the Donetsk railwey (covers 40% o naitional transportation), the Mariupol Port, the Donetsk Internaitional Airport, passenger airports in Mariupol an Kramatorsk, an dense road seestems. In the Donetsk Oblast twa special economic zones hae been creatit, Donetsk an Azov, which hae a privileged tax regime. In 1999, the gross grain yield in the oblast wis aboot 999.1 thoosan tons, succar beets – 27.1 thoosan tons, sunflouer seeds – 309.4 thoosan tons, an potatoes – 380.2 thoosan tons. An aa, 134.2 thoosan tons o meat, 494.3 thoosan tons o milk an 646.4 million eggs hae been produced. At the beginnin o 1999 thare hae been 2108 ferms athin the oblast. The Donetsk Oblast's climate is maistly continental, which is characterised bi het simmers an relatively cauld winters wi chyngeable snaw surfaces. East an sootheast strang winds, heich temperaturs an hivy rain shouers are teepical in the simmer. The average annual rainfallw is 524 mm. A widden brig leads tae the entrance tae the Khomutovska Steppe natur preserve in Donetsk Oblast. The basic minerals foond here are: coal (reserves – 25 billion tons), rock salt, lime carbonate, potassium, mercury, asbestos, an graphite. The aurie is an aa rich in fertile black earth. Important resoorces for recreation athin the aurie are: the mild climate, the Sea o Azov coast, curative mud, soorces o minerals, an radon an table watter. Due tae these numerous recreation resoorces, mony resort hotels an camps are locatit here. Thare are aboot 26 heal centres an pensions, 52 rest hames an boardin hooses, an rest camps for childer in the oblast. The curative auries in the oblast include the Slovyansk salt lakes an mineral watter soorces. The oblast an aa contains mony pairk zones, some o which are o great naitional value. Thay include the Khomutivsky steppe an the Azov sea coast. Oweraw, the Donetsk Oblast contains abouot 70 objects o natur an pairk fund includin branches o the Ukrainian steppe pairk, 6 state reserves, 10 memorials o natur, landscapes, an 6 pairk tracts. ↑ "Русский язык стал региональным в Севастополе, Донецкой и Запорожской обл". RosBusinessConsulting. 16 August 2012. Retrieved 16 August 2012. This page wis last eeditit on 23 November 2018, at 05:00.